World Antibiotic Awareness Week 2017 runs 13-19 November 2017. 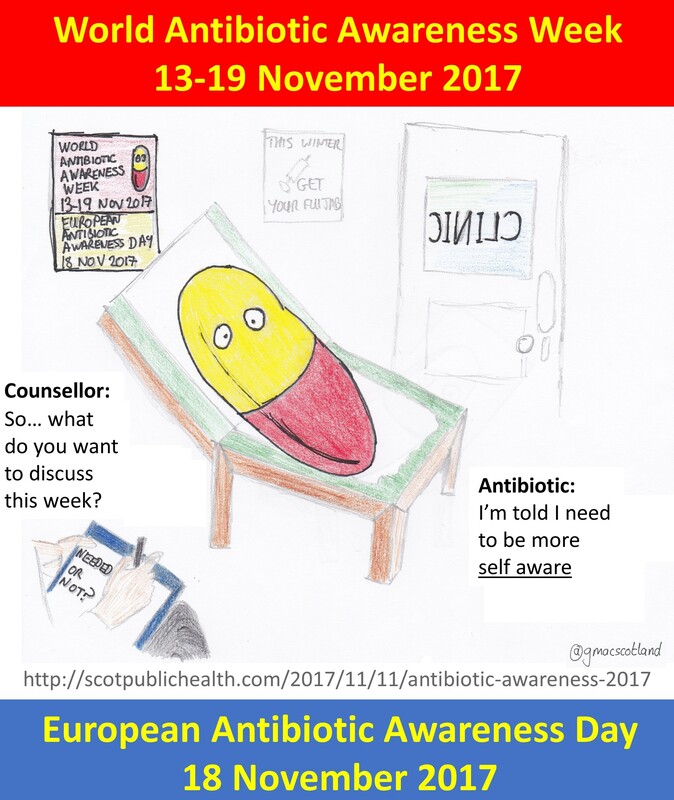 European Antibiotic Awareness Day in on 18 November every year. Antibiotic resistance and antibiotic awareness are important public health topics. The World Health Organisation lists prevention and control measures for different sectors including individuals, policy makers, health professionals, healthcare industry and agriculture sector. As previously discussed on this page antibiotic awareness campaigns attract a lot of tweets – professional and public facing. However it’s not clear which hashtag to use to tweet, or to search for during the week. This blog will be updated throughout the week to help you decide which hashtags to use and search for. I will summarise the top content using “big data” methods, listing the most retweeted tweets across the different hashtags. The weekend before the campaign I ran a series of “follow the hashtag” searches (to map tweets geographically, and estimate audience) for different hashtags, and three large NodeXL social network maps. Links to these analyses, and top tweets from the NodeXL analyses are provided below. I also produced a graphic of my own to provide a personal touch that I could also track during the course of the week. NOTE (13 September 2018): Since writing this blog Storify has been discontinued. I have therefore moved (I hope) all the summaries mentioned below to another site (Wakelet). I will need to update all the Storify links accordingly. Introduction: ScotPublicHealth work has always had a double purpose – exploring both public health and social media techniques. This post uses social media – and social network analysis (using NodeXL) in particular – to document tweeting about health/ healthcare. It looks at top influencers at UK and global level. I have developed an interest in social network analysis over the past year. The method allows us to look at interactions between Twitter users. It also provides a complete extract of tweets between stated time limits that can be used for further analysis in Excel. Back in July 2017 Helen Bevan’s team at NHS Horizons contacted me to see whether these methods could be used to identify the top 3% influencers around health/ healthcare tweets. I set out to refine the social network analysis methods that I had been applying to simple Twitter searches (eg around a public health awareness campaign or conference, with tweeting around a single hashtag) to answer this rather more complex question. The BMJ cover story on 9 September 2017 described the response to a Twitter ban at a large conference in the US. 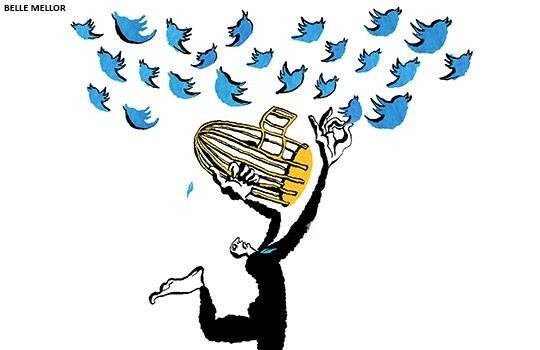 Was this a lot of witter, a social media storm in a teacup; or did it represent censorship and a missed opportunity to learn at a conference? I started using Twitter in 2013 when “early adopters” were evangelising about its potential. I learnt by observing others and started tweeting. Following people with shared interests led to connections and further learning. However, the idea of scrolling through lots of tweets on a small device has never appealed very much. Twitter provides a glimpse of clinical and scientific developments, often well ahead of print. Colleagues share ideas in accessible ways (eg infographics, short films, or blogs). However, the volume of information quickly becomes overwhelming. Big names across clinical specialties are on Twitter. Click from person to person, through hashtags, follow Twitter recommendations and you’ve lost an hour without much to show for it. You need a strategy to use Twitter effectively. Conferences are a great way to start using Twitter in a more structured way. Delegates and conference organisers often start tweeting using the conference hashtag a few days in advance. You will arrive at the conference prepared, with ideas of work to search out and people to meet. However, after the conference has finished you need to have a plan about how to stay in touch and informed. As a Public Health doctor I am interested in the big picture. The first time that I saw a social network analysis (SNA) map (of a conference via Mark Outhwaite, July 2015), I was hooked. These maps show interactions around a Twitter search term. It took me over a year to try my own maps, and another few months to understand the potential of these mystifying and beguiling green spaghetti junctions. In October 2016 I started to use SNA tool NodeXL to work through a series of topics, including conferences and health campaigns. Automated reports provide summaries including top influencers, hashtags and weblinks from tweets. However, richer information is available from the individual tweets captured by NodeXL. Sifting through tens of thousands of tweets takes a few minutes using approaches I have refined over recent months. I identify the most shared posts as a rapid means of “digital curation”: if something has been shared a lot it is either popular or controversial, so there will be something to learn. This approach gives a contemporary glimpse into the response of professionals, patients and/or public. You can access the resulting “big data” summaries even if you don’t tweet: e.g. see my summary of BMJ/ IHI International Forum on Quality and Safety in Healthcare #Quality2017. The approaches have wider application. Studying Immunization Week 24-31 April 2017 (hashtag: #VaccinesWork which is used year-round) I was interested – and concerned – that one of the tweeters with the biggest potential audience (number of followers multiplied by number of tweets(*)) was an anti-vaccination campaigner. Some weeks his tweets had a larger potential audience than large global campaigning organisations such as the World Health Organisation and UNICEF. I used SNA to study his connections. The anti-vaccination campaigner might have had a lot of followers, and a lot of potential views, but his tweets were hardly connecting. He was howling into the void. In comparison, the global organisations, and many individual vaccine advocates, achieved a much larger number of connections with accessible, clear and evidence-based materials explaining the benefits of vaccination for a general audience. The full analysis is available on my blog. (*) Go to “get analytics” at bottom of Symplur page and set dates you want to study. 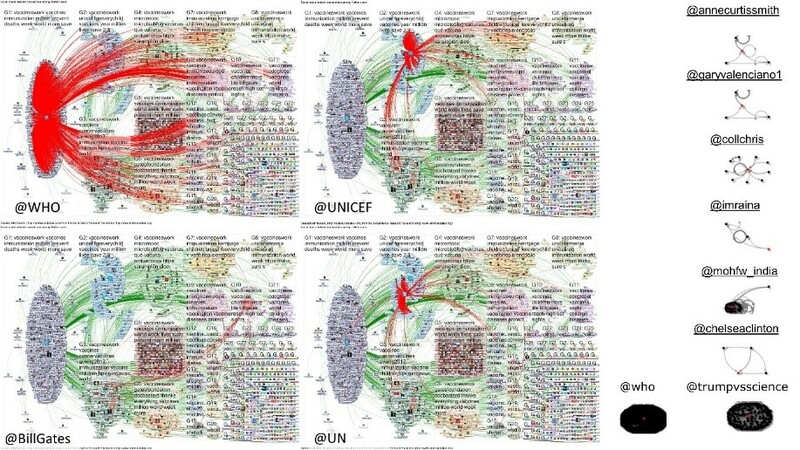 Source: #VaccinesWork tweets using NodeXL. In addition to searching for hashtags it is also possible to use NodeXL to study people, organisations, weblinks and words and phrases on Twitter. This approach can be deployed to look at specific questions – for example to study the considerable social media impact of the BMJ cover story on the conference Twitter ban. The method is also useful in keeping up to date with top medical journals more generally. A recent search (19-26 September 2017) identifies top content from almost 23,000 tweets by over 13,000 tweeters. The resulting top 50 summary includes videos of clinical examination (including an ocular trematode featured in NEJM), clinicians’ responses to journal articles and tightly worded summaries, with weblinks to clinical and academic content from across these journals. Julio Mayol, an early adopter of Twitter in his work as Professor of Surgery, writes about Twitter and surgical research in the December 2017 issue of BJS, but his points refer equally to surgery and clinical work more generally (see list below). The issue’s front cover features one of my NodeXL maps, after being approached by the journal’s social media champion, surgeon Richard Brady on 15 October, after an initial suggestion from Jonothan Earnshaw. As captured in a subsequent NodeXL map, BJS and Julio’s tweets about the article and journal issue feature prominently in tweets by and about surgical journals in November. Indeed 11 tweeters in that more recent NodeXL map achieve 85% of the retweets on that map (out of 146 tweeters). The speed of publication, and the journal’s interest in social media, social networks, and infographics, is impressive, and is amplified by the work of individual surgeons like Julio and Richard. Twitter therefore has huge potential for healthcare workers for CPD and networking, and to study their impact if active on Twitter. However, you don’t even need to be on Twitter to access this content. The approach to digital curation described here can provide an up-to-date view of the medical and scientific world, driven by and feeding an endless curiosity and desire to learn. To see this work moving from niche interest/ hobby to the front cover of two global publications (BMJ and BJS) over a period of 3 months is exciting, and the interest looks set to continue with a paper on my work on conference tweeting in press for January 2018. Meanwhile, I have stopped actively tweeting, concentrating instead on finishing my studies of health and healthcare tweeting without influencing the topics that I am studying. Links: My further outputs from NodeXL analyses are available at my ScotPublicHealth blog and Storify page, and these are updated regularly. I have no conflicts of interest to declare. This work has not been funded externally. I would like to thank Marc Smith and his colleagues at SMRF for their help in getting NodeXL set up on my computer and their ongoing input in refining and developing their software and helping me improve my analyses. Antimicrobial resistance presents a major challenge, but simple steps can to minimise the impact. Social media has a role in disseminating information during antibiotic awareness campaigns: information can be shared rapidly, widely, and cheaply. Hashtags are used to identify social media posts on a specific topic. The official hashtag for social media activity during the 2016 world antibiotic awareness week (14 to 20 November 2016) was #AntibioticResistance, with a separate hashtag for the official European campaign on 18 November 2016 (#EAAD or #EAAD2016). However, numerous other hashtags were used quite widely during the week, including hashtags for established professional-focused national campaigns such as #AntibioticGuardian, which originated in the United Kingdom (UK), and an unofficial hashtag that reflected the purpose of the week – #AntibioticAwarenessWeek. There was also some tweeting without hashtags. There were many tens of thousands of tweets posted during the campaign week by tens of thousands of individuals and organisations. It would not be possible to analyse this volume of tweeting using conventional methods. Accordingly, we extracted data using social network analysis (NodeXL) and Twitter searches to study the characteristics of tweeters and tweets using the most frequently used hashtags (official and unofficial) and without hashtags. An example NodeXL map is shown in Figure 1. The quality of the most popular tweets was assessed by looking at use of hashtag, image or mention of another tweeter. These are components that boost the impact of a tweet as described in the previous ScotPublicHealth blog post. The aim of the analysis was to identify whether there were differences in tweet content between the hashtags, to see if there is value in looking beyond the official hashtag, both for learning, networking and broadcasting. I’m writing this blog in preparation for the European Public Health conference in Stockholm, 1-4 November 2017 (#EPHStockholm). At the conference I will be presenting the #ScotPublicHealth work on quality and impact of tweeting during 2016 (read JPH paper here; please contact me if you do not have access to the article and would like a copy). I have recorded a dry run as a “video abstract” (far from perfect, but useful preparation for the presentation itself). Full slides are available too. The #ScotPublicHealth work emerged from the Scottish Public Health conference in Peebles, November 2015. It was clear that we should be attempting to network and share better across the Public Health community in Scotland – it was not enough to meet at an annual conference. Colleagues spread across large distances in Scotland did not have an opportunity to meet and discuss topics of mutual interest. I set out to improve connections using Twitter, but quickly learnt that colleagues wanted more advice about tweeting (see write up of #ScotPublicHealth tweet chat January 2016). The series of blogs and webinars that we ran around #ScotPublicHealth in 2016 has been described in a series of blogs on this page; these activities were an attempt to learn more about public health topics and social media and internet technology. We looked at physical activity with Prof Chris Oliver, assets based approaches to improving health with Glasgow Centre for Population Health, health inequalities with NHS Health Scotland and Institute of Health Equity, and realistic medicine with Scotland’s Chief Medical Officer and an expert panel. I compared tweets posted about “public health” in Scotland between September and December 2014 and compared these with tweets using the #ScotPublicHealth hashtag Autumn 2016. There was an increase in the quality of tweets as assessed by the % tweets with an image, URL and/or mention. There was also an increase in the impact of these tweets as assessed by the % retweeted (and the number of retweets achieved). The greatest impact was seen in tweets that used more than one key component (mention of another Twitter user, image and/or URL). It is clear from the findings that while general “public health” tweeting has improved, conference tweeting remains an area for improvement. Some people will only tweet on professional matters when prompted, for example at conferences. In my study this group of “conference tweeters” was less experienced than colleagues who had engaged in the #ScotPublicHealth work throughout 2016. Conference tweets in the #ScotPublicHealth study were less likely to include an image (which draws the eye in), a URL (which provides further information), or mention another Twitter user (which helps sharing). There was only a modest increase in quality of tweets between the 2014, 2015 and 2016 conference (⬆pictures, very small increase in use of URL though remained a small minority at 12% in 2016; no increase in mentions of other Twitter users). The under-utilisation of URLs at Public Health conferences is a missed opportunity. Microbiologist Jon Otter and colleagues have demonstrated that the URL is important in professional sharing, and this has resulted in very effective and informative tweeting at microbiology conferences (see summary in Lancet Infectious Diseases Media Watch article). If there isn’t a link to a paper, blog or video that explains the findings presented at a conference then people will be less likely to share it on social media. As scientists and clinicians we need to assess the credibility of information before we can assess whether we want to broadcast it. A policy post here (originally posted on the Get Healthy Start Facebook page, 22 Mar 2015): on helping Scotland to become the best place to grow up. I have been prompted to dig this out after seeing some recent tweets about Maslow’s hierarchy in the workplace and in schools. See these recent tweets here. This post looks at UN Convention on the Rights of the Child (UNCRC), Maslow’s hierarchy of needs, article 31 of UNCRC, and the particular gains from teaching more kids a musical instrument. Sources at end of post. Quality Improvement (QI) is a powerful approach for exploring and improving the way that healthcare is delivered. However, the technical terms surrounding the methodology can make QI seem inaccessible. This is a pity, as many of the techniques will be familiar to clinicians through their routine work. QI work is simply about making refinements to the way we work, one patient at a time, building a more reliable process, and keeping our sights on a bigger goal. This blog explains some of the key principles and approaches of QI work, stripped of its jargon, using 4 common objects as an aide-memoire. The formal QI tools on which these objects are based are listed in the notes section at the end of this blog. If you’d prefer a video summary then you can find a version here (Youtube). This work was prompted by a request by Ann Gates at ExerciseWorks on Saturday 7 October 2017. ExerciseWorks is a prominent physical activity focused Twitter account based in the UK but with a global reach. Ann was interested in demonstrating her Twitter following to a physiotherapy audience and asked if I could produce a NodeXL map (figure 1). I thought it would be interesting from a CPD perspective to look beyond the interactions shown in figure 1 to look at the contents of the most shared tweets, for ExerciseWorks and other NodeXL searches. This blog provides a quick summary of two health/ public health advocacy campaigns in Scotland, both launched at Scottish Parliament during 2017. The “State of Child Health” report was launched by Royal College of Physicians and Child Health on 26 January 2017, with events across the UK, including a RCPCH Scotland event at Scottish Parliament. I have summarised the Twitter activity around that day here. The “Fairer Lives Healthier Future” call to action was launched by the Faculty of Public Health in Scotland on 20 September, with events at the Royal College of Physicians Edinburgh and Scottish Parliament. Twitter activity during and after the launch is summarised here. The BMJ cover story on 9 September 2017 explored a Twitter ban at a medical conference in the United States. 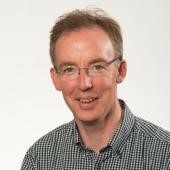 The article included responses to the Twitter ban from two of the most prominent physician tweeters from the US (Prof Michael Gibson and Dr Kevin Campbell), a couple of comments from me, and social network analysis (SNA) that I had performed looking at the tweets that emerged from the conference. The analysis showed that the ban itself was a much bigger topic of conversation on Twitter than any clinical or scientific learning from the conference. In this blog I explore the reach and impact of the BMJ article on social media in the days after publication.